A thin shell pavilion with an audio feedback program invites engagement. 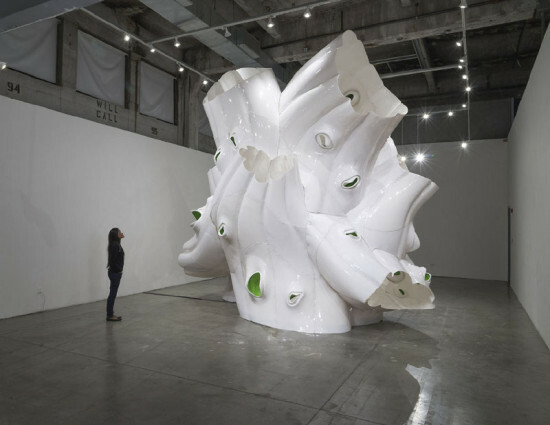 Apertures, the amorphous pavilion designed and fabricated by Baumgartner+Uriu (B+U) with students from SCI-Arc, challenges two of architecture’s defining dualities: the distinction between wall and window, and the division between exterior and interior. “Conceptually, we were looking at objects that are multi-directional and have apertures as their main theme,” said partner Herwig Baumgartner. “That was one aspect of it; the other was the barriers between inside and outside and how we can dissolve these. We’re interested in architecture that’s responsive through either movement or sound.” As visitors pass through or otherwise engage with the 16-foot-tall, 1/8-inch-thick structure’s many rounded openings, attached heat sensors trigger sounds based on human bio-rhythms, creating a feedback loop that encourages active exploration of the space. In addition to the themes of apertures and inside versus outside, B+U were interested in investigating the technology of thin shell structures. “How can you build something that’s over ten feet tall and very thin, and what’s the minimal material you can get away with?” asked Baumgartner. 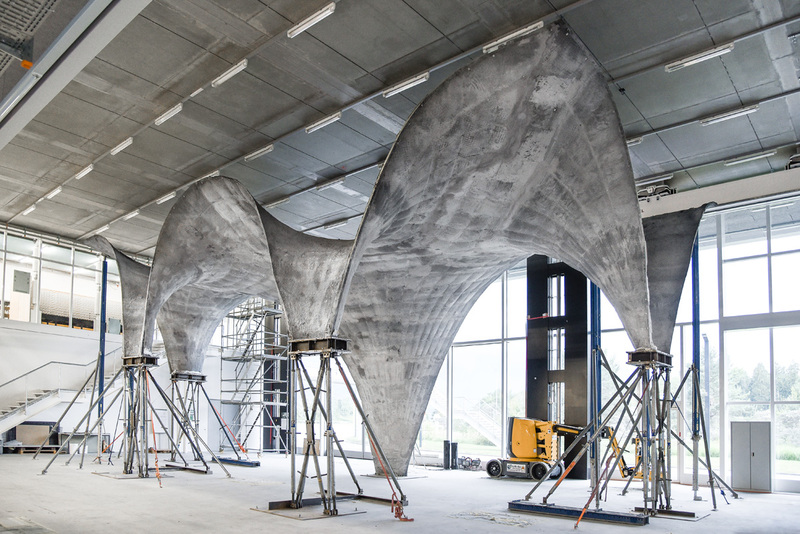 The architects used digital modeling software including Maya to determine the pavilion’s form, then constructed a series of mockups in different materials. “We’d be working with consultants, or we’d ask fabricators: how would they build this?” recalled partner Scott Uriu. “We were thrown quite a few interesting ideas. A lot of them wouldn’t quite pan out, but we were always working back and forth between digital and analog design.” The designers originally tried building Apertures out of acoustic foam. “It was interesting for us because it creates an absorptive environment, but it was very weak,” said Baumgartner. They considered supporting it with an egg-crate structure. “But in the end we said, ‘Let’s get rid of the structure and make the surface the structure,’” he explained. They landed on heat-formed plastic, a thin material that becomes self-supporting when molded into certain shapes. “We did a mockup and we really liked it,” said Baumgartner. “It’s glossy and shiny on the outside, but the inside was matte. It has a very different interior and exterior.” Matt Melnyck, a principal at Nous Engineering, worked closely with B+U to insure the pavilion’s stability.